In the third part of this series, I'll cover using DNS2TCP on unix-like operating systems. DNS2TCP is not written in perl. It's a set of small C programs. It can tunnel multiple types of traffic, as opposed to OzymanDNS which is designed to be used as a Proxy Command for SSH. Compiling is straight-forward once you download it. This worked on all platforms I tried it on, which includes Ubuntu Linux, OpenBSD, and Mac OS X. That's it for the server side. Now, on the client end, compile and install dns2tcp as well. Configure the "dns2tcprc" file. Unfortunately, it can only be configured with one "ressource" at a time. I am going to use SSH with dynamic proxy again. Where DNS Server is a DNS server you can access, and probably should be the one you were issued by DHCP. 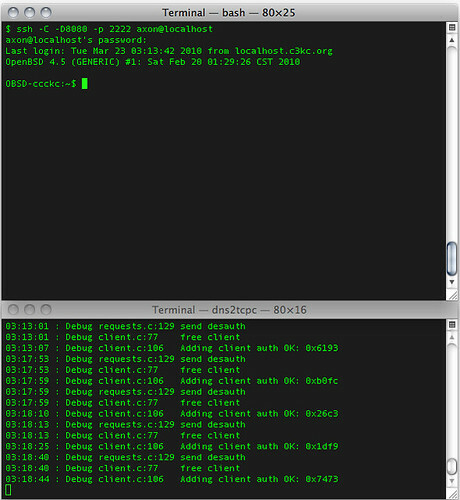 In the screen shot below, you can see both the SSH session and the dns2tcp client window open. 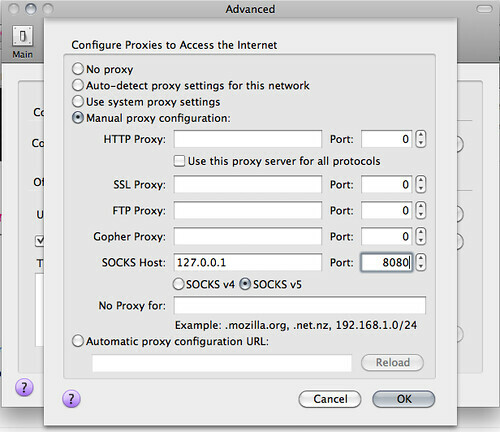 Again, configure Firefox to use the dynamic port you specified above as the proxy on localhost. After this, you should be in action!